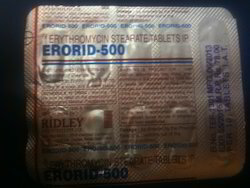 We have gained expertise in trading, supplying and exporting Erythromycin Stearate that is available in various size of packs at industry leading prices. All the medicines are formulated using quality ingredients, at our vendors end. These medicines are also thoroughly checked by expert quality controllers on various parameters to ensure zero impurity. We have with us a team of expert professionals, which supports us in trading, supplying and exporting Erythromycin Stearate. Available in different size of packs, our medicines are widely prescribed by various doctors across the global market. To keep the medicine safe, before delivery, we store these in our capacious warehouse.